Coming to Birmingham to study might be your first time living away from home. Our student accommodation will allow you to enjoy your new-found independence in safe, welcoming and sociable surroundings. Just a 5-10 minute walk from the University’s own train station and campus, Pritchatts Park Village offers you the perfect gateway to university and city life. The village is also situated next to the exuberant area of Harborne. Selly Oak Village is the closest village to campus and situated in the thriving student area of Selly Oak. Home to much of the student population, Selly Oak provides plenty of choice for bars, cafes, dining and supermarket shopping. Set in the beautiful surroundings of lakeside parkland, the Vale Village is the University’s largest accommodation site, home to more than 3,500 students in eight residences and home to the Meal Plan. Much of our partner accommodation can be found in Selly Oak, just a few minutes' walk from our campus, while some are closer to the vibrant city centre. 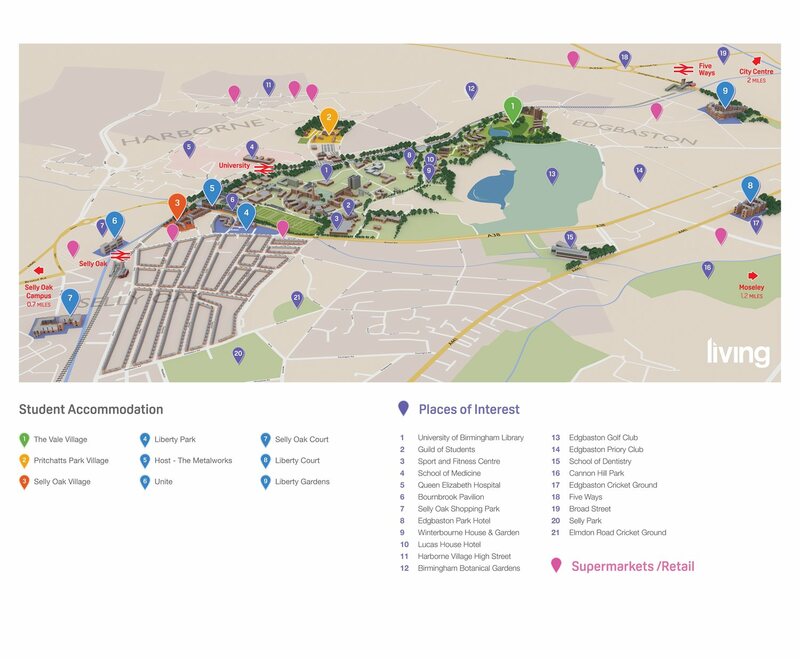 All of our accommodation is within a 2 mile radius of the University. Details and other conditions are subject to revision on occasion. Services may be added, changed or withdrawn, and will be updated here. Please note that partner accommodation forms approximately 25% of our accommodation offering.